Sacra Liturgia has announced its major activities for this coming summer, a conference to be held in June in Milan, from June 6-9, and the annual liturgical summer school, from August 5-17. The conference sessions of Sacra Liturgia Milan, will be held in both Italian and English, with simultaneous translation of all presentations, at the Catholic University of the Sacred Heart (Università Cattolica del Sacro Cuore) centrally located in Milan next to the Basilica of Saint Ambrose, where many of the conference’s liturgical celebrations will take place. The full program, to be released at Easter, will include Vespers and Mass according to the Ambrosian Rite (in both its ancient and modern uses) in the Basilica of Saint Ambrose, the Metropolitan Cathedral (Duomo) and in other locations to be announced. One afternoon will be kept free for cultural visits, including a special visit to the Pinacoteca Ambrosiana and the Duomo. Full time registrations are open now. Part time registration will be possible after Easter when the full conference program is published. Delegates are responsible for their own accommodation arrangements; the Sacra Liturgia Secretrariat is happy to give recommendations for local accommodation upon request. His Eminence Robert Card. Sarah, Prefect of the Congregation for Divine Worship, and Bishop Dominique Rey of Fréjus-Toulon, at last year’s Sacra Liturgia Conference in London. Abbot Christopher Zielinski OSB Oliv. – The Liturgical Formation of the Human Person: Awakening the soul of contemporary man. The Fourth International Sacra Liturgia Summer School will be held from August 5-17 in La Garde-Freinet (Provence-Alpes-Côte d’Azur), France, an English-language liturgical summer school following on from the international Sacra Liturgia conferences in Rome, New York and London and the summer schools from 2014-2016 organised by the Monastère Saint-Benoît of the Diocese of Fréjus-Toulon. Designed for families, individuals and groups of clergy and laity who wish to holiday in Provence in the South of France whilst having the opportunity to participate in liturgical celebrations according to the usus antiquior of the Roman rite, this year, the summer school will have the privilege of welcoming His Eminence, Raymond Leo Cardinal Burke for the celebration of Pontifical First Vespers and Solemn Mass at the Throne for the Assumption of the Blessed Virgin Mary. Bishop Dominique Rey of Fréjus-Toulon will welcome His Eminence and be present at Vespers; Cardinal Burke will also give a conference on the Sacred Liturgy for participants. 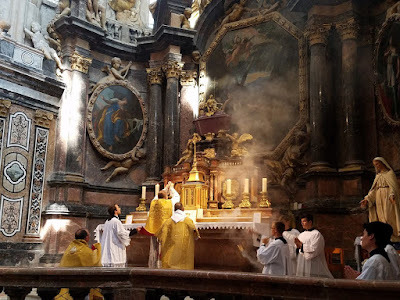 The summer school includes pilgrimages to and the celebration of solemn Mass in the Royal Basilica housing the relics of St Mary Magdalen at St Maximin-La-Sainte-Baume, and the chapel housing the relics of St Roseline of Villeneuve (†1329). A visit to the ancient Cistercian Abbey of Le Thoronet is also possible. Solemn Mass at the Basilica of St Mary Magdalene during the 2016 summer school. The summer school includes practical formation in Gregorian chant (for beginners and for those more advanced), and in the ceremonies of the usus antiquior for priests and seminarians wishing to learn how to celebrate Low Mass, how to serve as deacon and subdeacon, and for seminarians and servers who wish to learn more about the rites and how to serve as a Master of Ceremonies. The daily schedule gives over the mornings to practical training (approximately 14 hours of tuition in total), with presentations and discussions (presenters and topics to be announced) taking place in the evenings after vespers. Afternoons are free for relaxation and exploring the region. The mountain village of La Garde-Freinet, situated in a wine growing region some 20 km from Saint-Tropez and approximately 15 km from the Mediterranean sea, is an ideal holiday location with mountain walks, a Provencal market, shops and restaurants. English is widely spoken in the village. Participants will arrange their own accommodation, meals and transport.